Free to be Frugal has packed its bags and moved. It has a new name more reflective of the content on the site . And it has a new, easier-to-remember address. Looks like it will be a good Sunday to buy an extra newspaper or two or three. According to the folks over at thecouponclippers.com, there will be three nice-size inserts in this Sunday’s papers. Click here to check out the list to see what coupons you may be interested in. Then click on each of the inserts listed under May 17: Smart Source, Valassis and Proctor and Gamble. By buying extra papers, you’ll be able to maximize your savings and add to your pantry stockpile when you match your coupons to store sales. And, with my journalism roots, I can’t resist an opportunity to put in a plug to buy extra papers to boost those ever-shrinking circulation numbers at newspapers across the country. Click here, here and here for past posts on why I think newspapers are still a smart purchase. A couple coupons that caught my eye for this weekend: 75 cents off 1 package of Breyers Yo Crunch 100-calorie packs of yogurt and 55 cents off 1 package of Nabisco Chips Ahoy cookies. In double- and triple-coupon land where I live, those two coupons have huge potential. And don’t forget about my shortcuts for clipping all those coupons from multiple papers. Click here to save yourself all kinds of time and aggravation. One last remember: Next Sunday, May 24, there will be no Sunday coupons because of Memorial Day weekend. Another month and the first of the three bushes should be ready to pick. 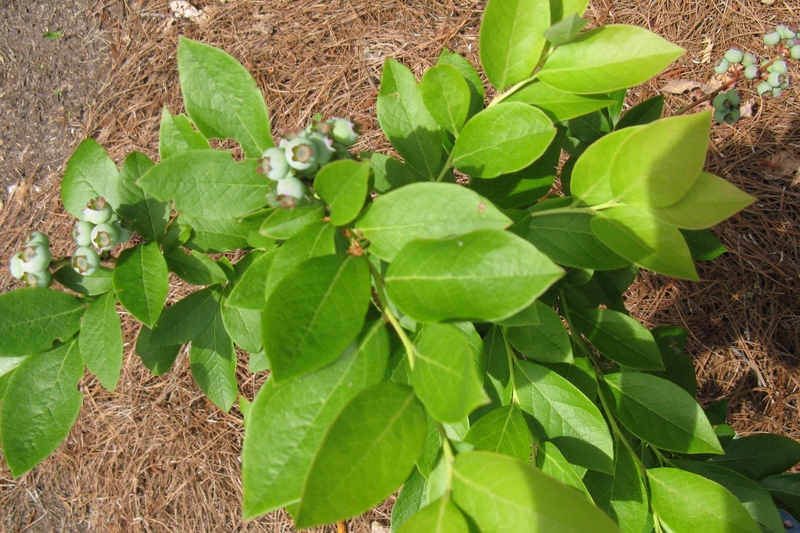 After researching what types of blueberry bushes to get, we settled on two Rabbiteye and one Southern Highbush. You need at least two types, we learned, for cross pollination to increase the yield and quality of the fruit. 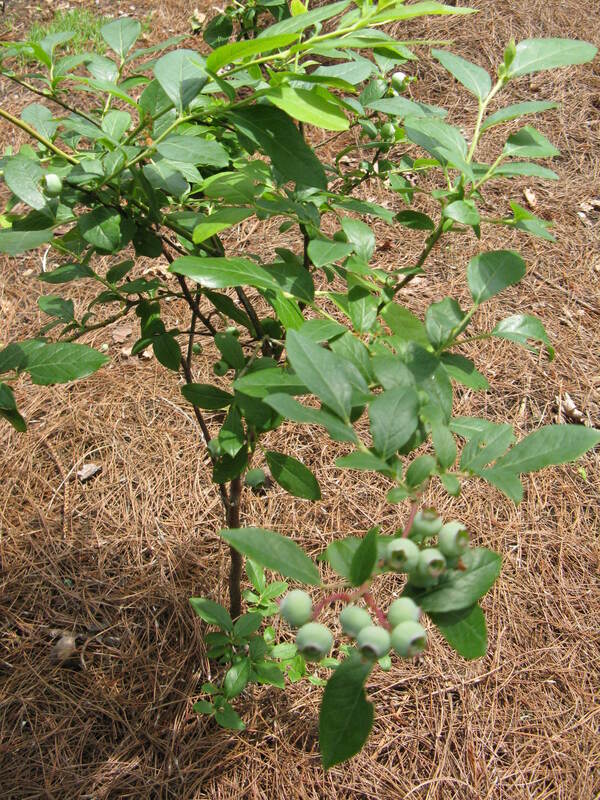 From these two types, we chose three different varieties, which will bear fruit at varying times in the blueberry growing season. This will spread the wealth, so to speak, and won’t inundate us with fruit once the bushes grow larger. Now there’s only one thing standing in our way to a successful first-year crop. Birds! I’m not much for entering contests and I’ve never even played North Carolina’s lottery. But I have been known to enter a drawing now and then when I thought my chances were good. Click here to read a post about my thoughts on contest strategy. But in a nutshell, if the prizes are plentiful and/or the entries few, I will enter a contest. And that’s exactly how I won the Earth Day contest at CVS. I picked up my winnings today and couldn’t believe how generous the prize package was. This is what I got: an eight-pack of two-ply paper towels, a 12-pack of one-ply toilet paper, a package of 250 napkins, a package of 12 lawn and leaf bags, a package of 12 tall kitchen bags, a package of 20 bowls, a package of 15 paper plates and two reusable shopping bags. The paper towels, toilet tissue and napkins are made of 100 percent recycled material. The plates and bowls are made from sugarcane and are biodegradable. And the trash bags are also biodegradable and made from recycled plastic. What a (cheap) thrill. OK, now you know exactly how much of a frugal geek I am. I had almost forgotten about the contest when I got the good news yesterday via telephone. 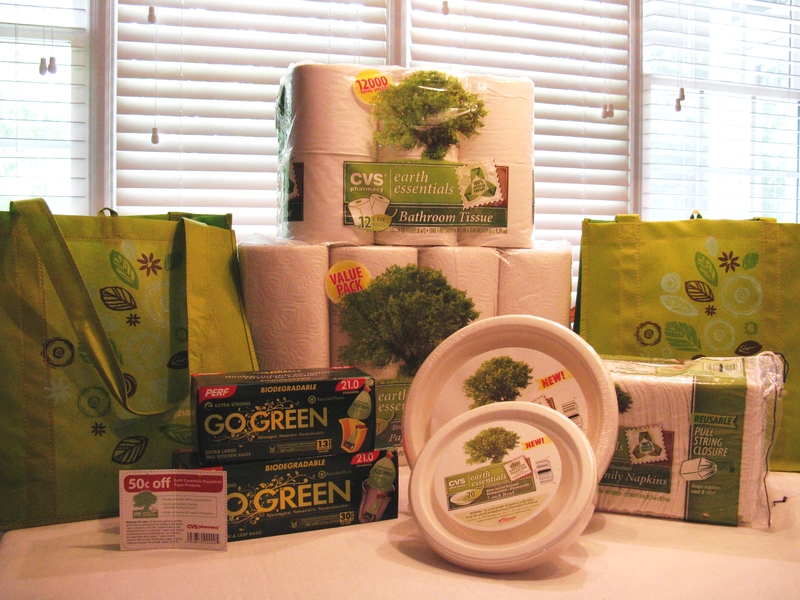 In honor of Earth Day, each CVS store offered customers a chance to win a selection of its Earth Essentials and Go Green recycled products. 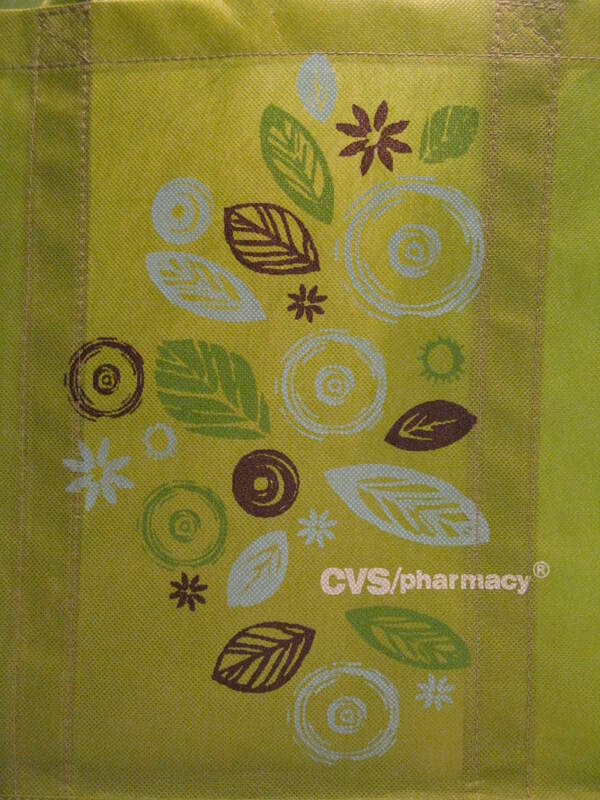 For each entry, you had to purchase one of the drug store’s reusable bags. The day I entered, I peered into the reusable bag holding the entries and there were only two slips of paper. Opportunity was definitely knocking. I bought a few bags at 99 cents each, and the cashier asked me if I’d like to use the 50-cent coupon attached to each bag. Until he told me, I didn’t even know there was a coupon on the bag! So for 49 cents each, I entered the contest and got a great reusable bag. I could feel the good karma percolating. I’m not exactly sure how much the items I won are worth but I’d estimate the value of the paper goods at more than $30. Not a bad return on my investment. As I said: a cheap thrill. We’re always looking for fun — and free — things to do as a family. But typically, these events are geared to our youngest member of the family, 11-year-old Caroline. So when my frugal friend Carolyn mentioned free tours and sampling at a local craft brewery, we jumped at the chance to take an adults-only field trip with our 21-year-old son, Andrew, who is home from college ever-so-briefly before heading out for a summer internship. Not only did we get a behind-the-scenes education in craft brewing, but we got to sample the six beers that Carolina Brewery currently has on tap at its Pittsboro, N.C., location. 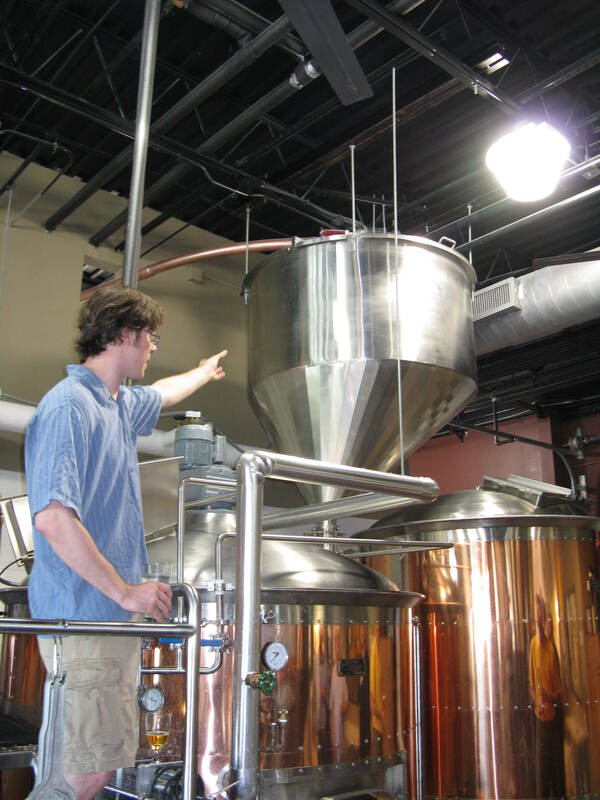 The brewery’s original location is on Franklin Street in Chapel Hill. Led by brew master Nathan Williams, the free tours and tastings are offered the second Saturday of every month at noon and 1 p.m. Click here for more information. My guys were so excited you would have thought I had gotten them free tickets to see Dave Matthews in concert. This was their kind of freebie. As the tour began with an explanation of barley and hops, the brew master poured us all generous glasses of a golden ale called Sky Blue. We sipped on that as we moved from the mash tun to the beautiful copper kettles to the fermenters and filters. After taking a peek inside the cooler, we each tasted the five other beers currently on tap: Copperline Amber Ale, Flagship India Pale Ale, Oatmeal Porter, Alter Ego and to Hell n Bock. I loved the Sky Blue, but most of the rest were too strong for me. A beer connoisseur I am not. But my guys savored each one. My husband gave high marks to the Flagship IPA, while my son put his stamp of approval on Alter Ego. We are also now official members of Carolina Brewery’s “Brew Crew,” which will get us invites to special events and private beer tastings. Additionally, we are participating in the brewery’s frequent diner’s program, which will reward us with meal discounts and other perks. I just love local businesses that go out of their way to make their customers feel special. 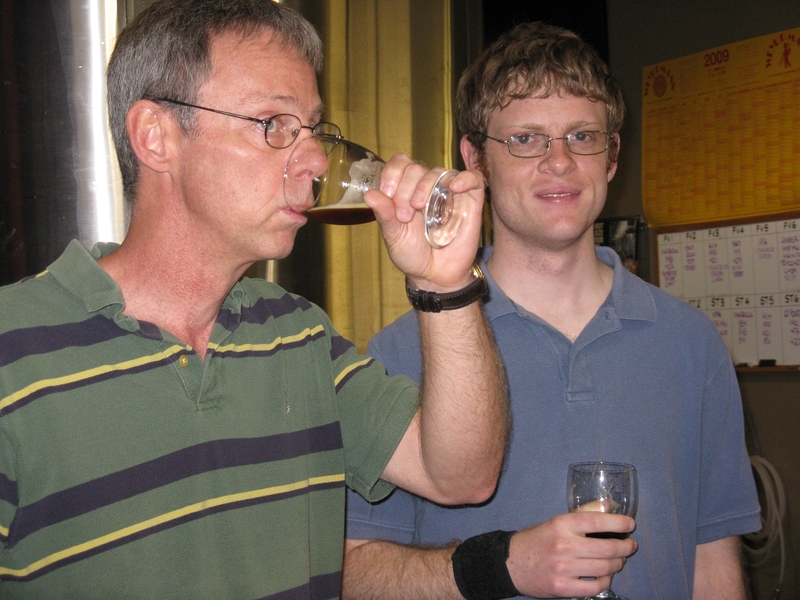 While we don’t spend a lot of money on dining out, the Carolina Brewery’s casual, fun atmosphere — and, yes, the lure of a free beer now and again — has successfully won our business twice in the last month alone when special occasions cropped up in our family. Never underestimate the power of the freebie. It’s May. And in North Carolina, that means it’s strawberry season. And in my house, for the last decade, that means it’s time to make jar upon jar of strawberry jam. Granted, it’s a lot of work — the picking, washing, cutting, crushing, cooking, sterilizing and cleaning up. But when those Ball jars are filled and I hear that satisfying “ping” as the jars seal shut, I can’t help but feel just a tad smug. All of that labor in the month of May translates to more leisure in the month December when I attach homemade gift tags to these crimson-filled jars and give them as Christmas gifts. And who doesn’t need a break in December? So this past week, with temperatures in the 80s and my AC cranking to combat the heat emanating from the stove top, I was humming Christmas carols as I stirred juicy crushed berries picked from a farm less than five miles from my house. Not only do I have my neighbor and teacher gifts taken care of seven months early, but I’m giving them something I made. I’m giving them something affordable and I’m giving them something that is consumable in a container that is reusable. In my quest to save some green, be green and lead a simpler life, I’ve got all my bases covered. I’m no Martha Stewart, but I would have to say my jam is a very good thing. The recipients of my jam are typically friends, family members, neighbors, my daughter’s teachers. I have a feeling that if I broke with tradition and delivered something different to my neighbors, there might be rioting on my tidy suburban street. OK, that’s a bit of an overstatement. But they would be sorely disappointed. 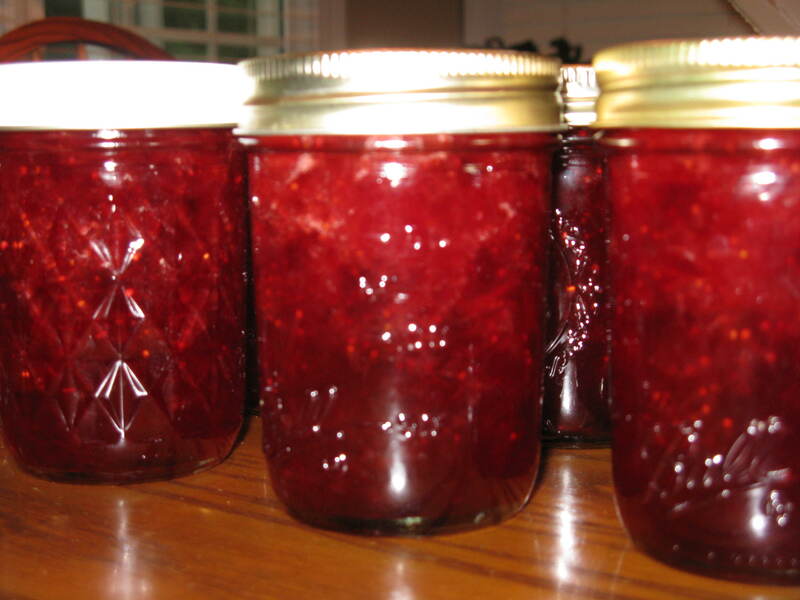 Throughout the year, my neighbors will make not-so-subtle references to my strawberry jam in casual conversation. Often, I will find empty jars left at my front door. A silent plea for more. 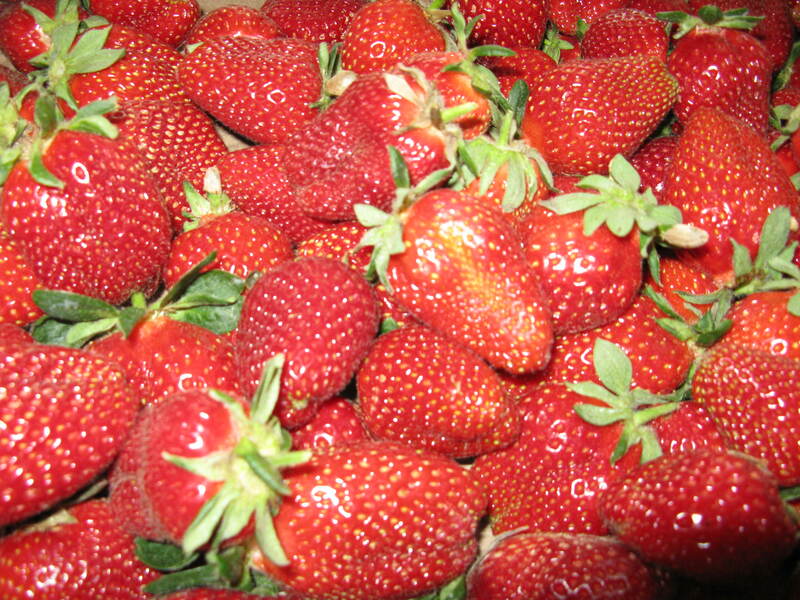 *at the strawberry farm nearest my home, pick-your-own berries are $1.50 per pound. It takes three pounds to make eight jars of jam. *at Harris Teeter, my grocery of choice, sugar is $2.27 for a five-pound bag; Sure Jell fruit pectin is $3.15 a box; and a 12-pack of Ball jars is $7.99. Twelve replacement seals are $1.79. That’s roughly $14 to make eight jars of jam. Of course, I’m always on the hunt to save even more money. This year, thanks to some nicely timed bargain shopping throughout the year, my jam is costing me only about $4 to make eight jars. That’s just 50 cents per gift. OMG. That’s the first time I’ve ever done the math. I can’t think of a nicer gift at such an affordable price. *shop year-round for bargains on sugar, pectin and jars and seals. I have had great luck finding these on clearance. Last fall, for instance, I found boxes of pectin on clearance at Walmart for 75 cents a box. That was a great price, but I ended up paying just 25 cents a box after using the 50-cent coupon inside each box. Since the boxes were all dated 2010 and 2011, I bought enough boxes to last the next three years. This year’s sugar supply was free, thanks to a great coupon that tripled at Harris Teeter. The seals were also purchased on clearance for less than half the regular price. *check yard sales for canning jars. Two or three years ago, I hit the jackpot, buying six boxes of canning jars that were still sealed in the boxes for $2 each. Someone’s jam-making plans that went bust turned into my bargain. *encourage your jam recipients to return the jars and rims, which can be used over and over again. Only the seals must be replaced. *ask your farmer if he has bruised fruit for sale at a lower price. In the height of the season, farmers at the farmer’s market are often willing to sell their culls at a lower price. *finally, don’t be intimidated. Jam is not that difficult to make. I simply use the recipe chart included in every box of fruit pectin. Later in the summer, I will make blueberry, peach and fig jam, depending on the availability of local fruit and the price. Last summer, I was fortunate enough to be given fresh figs from a friend’s tree, which I turned into jam. There’s something almost magical about giving homemade jam as a gift, particularly at Christmastime. It’s reminiscent of simpler times. And reminiscent of spring. I didn’t know whether to laugh or cry this morning when I read a tweet from Mike Fuchs over at the Greensboro News & Record. No, not because they were hungry. A lot of customers were hoping to take advantage of a Kentucky Fried Chicken coupon good toward a free, 2-piece grilled chicken with two sides and a biscuit. I’m about as frugal as they come, but c’mon. The police, the fire marshal. Holy cow. The chicken is not that good. Sounds like we need to call in an expert on freebie etiquette.